The best search marketing tools you can expect from the leading SEO companies should include "Hashtag Engine Optimization" as a search engine optimization ranking factor. Especially for eCommerce search engine optimization, HEO makes your online store successful and well ranked on the search engines. Our social world is increasing. With several social network media like Twitter, Facebook, Instagram, etc. it offers an excellent way to optimize the business. Earlier SEO was on the cover page, now HEO is also finding its place on social networks. Unlike SEO, HEO has also become the essential part of the world of optimization & now the search engine optimization professional recommended HEO for social engine optimization. Earlier Hashtags were used by social media early adopters. But it has become a required part of our smart device culture. The hashtag was firstly used by Twitter and is now used widely throughout the social media. The hashtag SEO is a metadata tag or the label used on social networking services. This makes the researcher easier to find the messages that contain specific content or theme. Hashtags are the group of words or a single word written after '#' sign. It has become easier to find out the content related to a particular topic with the Hashtag. Whether you are managing a business or a blogger, you want your content to be found using search engine optimization for Google. The biggest obstacle is there are several websites, and blogs get published every day. It has actually become hard to find the required text online. HEO is a new concept that can help you to get your text or website found online. Let us see how HEO works! Last time we saw, LSI Keywords: How To Use For Better SEO Traffic for better Keyword optimization, and today we are going to check more about hashtag optimization for better SEO optimization. As per Oxford English Dictionary, ‘hashtag’ is a word or a phrase preceded by a # (hash) symbol. The title preceded by hash symbol identifies the content is related to any specific topic. These days many people place ‘#’ in front of the message uploaded on social media. Actually, the hashtag began its life on Twitter. But today, it is rocking all the social media. You can easily find them on Facebook, Instagram, Pinterest and even on Google+. Today, the Hashtags are used very frequently. The main purpose behind using Hashtags is they serve a certain purpose magnificently. 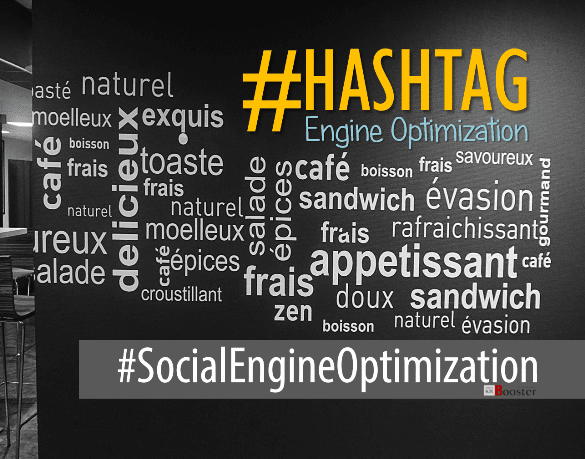 Social engine optimization - In technical terms, Hashtag is metadata. It allows people to look for related topics especially on social networking sites. It works just similar to SEO but offers huge exposure as compared to SEO. In other words, Hashtags hold power to drive traffic towards the website through social networking sites. HEO is a fresher concept in social engine optimization marketing strategy. But, it is very powerful as compared to SEO. As per the SEO web development approaches, the HASHTAG SEO is mainly concerned with finding 'Trending Hashtag.' Then, comes the creating the content relevant to the Hashtag. Next is to get wider exposure in the social media sites by putting the hash symbol in front of the title. As the content gets published on social media channels, it gets massive exposure. Once you have search engine optimized your content, it can drive heavy traffic to the website, blog or landing page. At present, HEO is new and infancy stage. There is a very less amount of competition. And it serves the more immediate results beyond the expectations. If combined with SEO, it can be very successful to bring heavy traffic to the business website. Hashtag in social media optimization. Let us see how Hashtag works efficiently in social media optimization. Suppose you have a website of your business and wants to get exposure for the same. You can optimize the content and updates with Hashtag so as to reach more and more people. For this, you can publish the topic on social media by adding a hash symbol before the topic name; like - #problogbooster. With this # symbol, the content becomes far more visible to others as it gets circulated very fast on the social media platform. Search engine optimization for business - Hashtags are excellent for marketing purpose. It helps the company to gain reach for the brand, increased exposure and help the people to find your brand. Communication with an audience has now become easier with Hashtags. Its one of the top SEO tips helps you to improve your website's online visibility. Hashtags are extremely useful to drive traffic to the landing page of the business’s website. With Hashtag the company gets more exposure and can reach more and more people. For improved results, the best thing a company can do is create successful social media campaigns and improve its reach. Hashtag tools play a vital role in helping how to use Hashtags more efficiently. There are plenty of tools available to help you and your company Hashtag more effectively, efficiently and productively. Overall, these tools are designed to serve you the real-time and greatly valued data regarding market research. This is one of the most useful Hashtag tools. It is very helpful for finding the current content. It works as an engagement tool. It is more than that of analytics tool. This tool offers easy engaging and sharing. It lets you track Hashtags from the top ranking social media platforms namely, Twitter, Facebook, Instagram, Google+ and Vine. The tool helps you to see how your Hashtag is doing on various platforms. The harshtags(. )org serves with the extensive list of Hashtags those are trending currently. With this tool, you can easily find out Hashtags those are already in existence. It also helps you to find out which Hashtag is being tweeted most within 24 hours. The tool also offers the information about how to use Hashtags. If you are very new to hashtag and not sure what to hashtag, RiteTag will serve you the best. It gives you the hashtag analytics data about which Hashtag is more likely to be seen and used by the others. Once you compose Hashtag, the tool highlights the same and indicates its chances of huge exposure. In short, it recommends the alternative Hashtags that can be noticed more likely. This is yet another useful Hashtag tool that tells how effective your Hashtag is. The tool plays a vital role in making you know the impact of your Hashtag during your event or campaign. TweetReach displays the most important information about how your Hashtag is generating discussions and retweets. It also showcases the who saw your tweets. Posting the content or Hashtag across the variety of social media channels is a very challenging thing. Very often, the people are unaware of the same. The HootSuite tool is excellent for this purpose. HootSuite tool allows you to post Hashtags on all popular social media channels. It is also possible to pre-schedule the post with HootSuite. It helps to track the Hashtag activity. After a trial period, Twitter is officially increasing its signature 140-character limit. Twitter has authoritatively unleashed its 280 character count to the public. The 280 characters structure on Twitter was now open globally. Most of the users should automatically notice the 280-character feature. If not, they need to update the mobile app or if they should refresh the website of twitter.com on their PC. Those users tweeting particularly from the Japanese, Korean, & Chinese will continue at the 140 character limit at the moment but soon will get updates. Twitter reviewed the 280 characters with chosen accounts in September 2017 and has presently rolled out the 280 char. limit feature to all of its users worldwide. Now you can add more Hashtags to your tweets to draw more attention from the online public. Hashtags are great and serve great for marketing of products and services online. Whether you want exposure for your latest products, services, campaigns or events; Hashtag is the answer. In order to gain reach for your brand, it is vital to turn towards Hashtags. In order to experience increasing exposure, Hashtags are the ultimate solution. With Hashtag, now you can communicate with your audience which is really a great success for your business. Hashtag tools are also available to improve your social media exposure. With lots of Hashtag tools, you can easily engage and share the content with your target audience. Let me know which hashtags you use and which tool is the best suit you and your business website. Please do comment, like and subscribe to our newsletter.